We communicate in thousands of ways every day. Some prefer certain kinds of communication over others, and that’s important to know when working with a team or running a business. You can have all of the ingredients of a successful business or project, but if good communication is missing, then the process of productivity will eventually begin to breakdown. 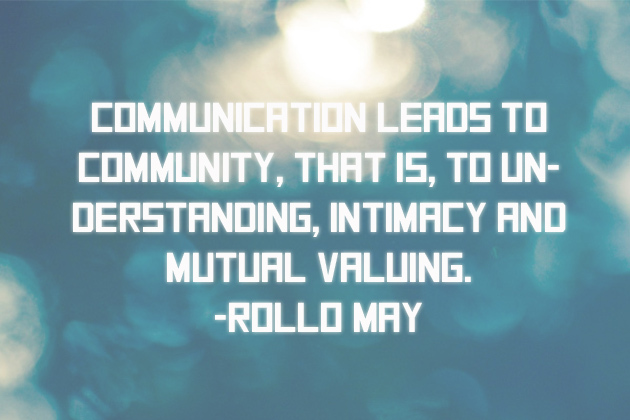 What can you do to ensure that communication is hitting it’s maximum potential among your team? 1) Have a team pow-wow allowing your members to share the ways in which they like to communicate, and the areas they have trouble communicating in. This way, everyone will have a general understanding of each other, and everything get’s laid out on the table. 2) Share your expectations of how you would like the team to communicate with each other, where you are flexible, and where you stand firm. 3) Come to an agreement on how the team will decide to communicate with each other. 4) Make sure your team knows that they are allowed to voice their frustrations and issues with you. There’s nothing worse than having a team member that feels as though they cannot voice their opinion or vent (respectively, of course). When this is the case, that team member will eventually start to hold things in, becoming bitter. This creates a tension within the team, and can erupt or end in all kinds of bad ways. 5) Encourage your team members to encourage each other. It is important for your team to communicate good efforts and praise, so that the motivation and inspiration keeps on flowing. These 5 easy steps can change the entire attitude and work flow of your team. One way you can constantly remind them of the communication process is by having the standards and expectations you came up with displayed in the office or break room. You can even have a “Communication Station” Set up with a creative sign posted, and a blank space where people can write encouraging notes to each other. This kind of board will need to be custom made by you, which is exactly what we specialize in! Let SpeedySigns.com be apart of your new effective communication process, and build your custom “Communication Station” sign with us today!